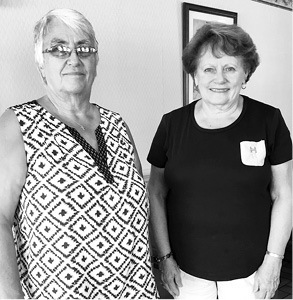 The Clinton County Retired Teachers Association recently elected officers for the new terms at its regular meeting. 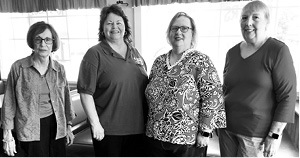 The officers are pictured in the top photo, left to right: Patty Combest is remaining as Vice President, new president is Connie Armstrong, new treasurer is Debbie Craig, and new secretary is Martina Brown. At left, former Association officers Shirley Ryan and Devonda Flowers are pictured (not pictured, Jean Maupin). A special thank you to outgoing officers Shirley Ryan, who was president for the last ten years, Devonda Flowers, who was treasurer for eight years, and Jean Maupin as secretary. The Association thanks them for their dedication to the Clinton County Retired Teachers Association . The next meeting will be Tuesday, November 6, at Lee’s Famous Recipe at 1:00 p.m. It has also been reported to the Clinton County Retired Teachers Association by Tim Abrams Executive Director of KRTA (Kentucky Retired Teachers Association) that the General Assembly officially adopted House Resolution 19 declaring October 14-20 as Retired Teachers Week in Kentucky. Established in 1957, KRTA has 31,000 retired educators in the state whose sole purpose is to look out for the welfare of retired educators. Retired teachers continue to render valuable services in diverse leadership roles in their communities. These individuals represent a loyal, patriotic, and concerned citizenry, which provide dedicated and dependable support to the leaders of our communities, state, and nation.